Protocase is a unique business that provides fully finished custom electronic enclosures with a 2-3 day turnaround, no minimum orders, and super service from sales and tech. It is built on deeply lean manufacturing and carefully designed processes, but most of all, never losing focus on the fact that Protocase is here to help their customers get their jobs done, fast and simple. Protocase builds what their customers design, which ranges from simple customizations of standard packages such as rackmounts, u-shapes, and front panels, all the way to large and complex cabinets and consoles. 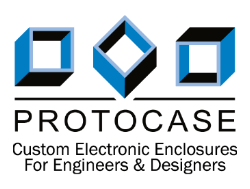 If you design and build electronics, but don’t have expertise in sheet metal design, you can enjoy the benefits of professional quality custom enclosures by using Protocase’s super-simple processes. Their expert designers can quickly and cost effectively create a design for you, starting from as little as a rough sketch or components. Their Protocase Designer 3D enclosure CAD software and online enclosure template generator are free, easy to learn, and fast to use. Protocase now has over 100 employees and 8000 loyal customers who work for organizations that range from small businesses to the best known technology companies and research institutes. They come from the United States, Canada, UK, and all over the world, including Asia and Australia. The experience that Protocase delivers is what keeps their customers coming back again and again. They invite you to check out what they have to say, but most of all, Protocase hopes you’ll work with them next time you need enclosures so you can experience the difference for yourself.